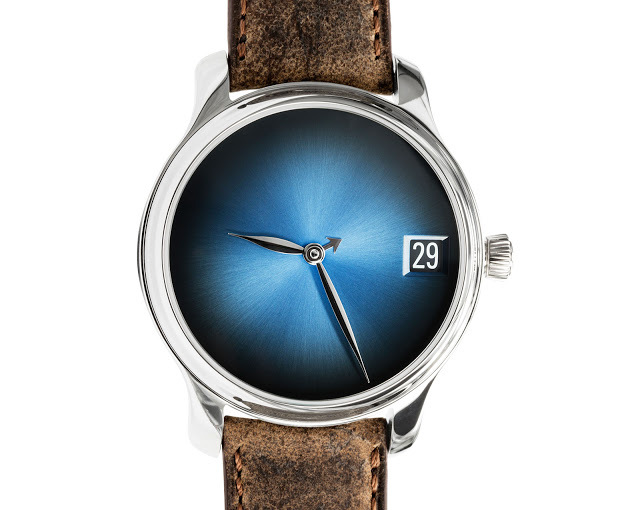 Highly regarded for its sensibly clean layout, the H. Moser & Cie. Perpetual Calendar does a lot with very little. 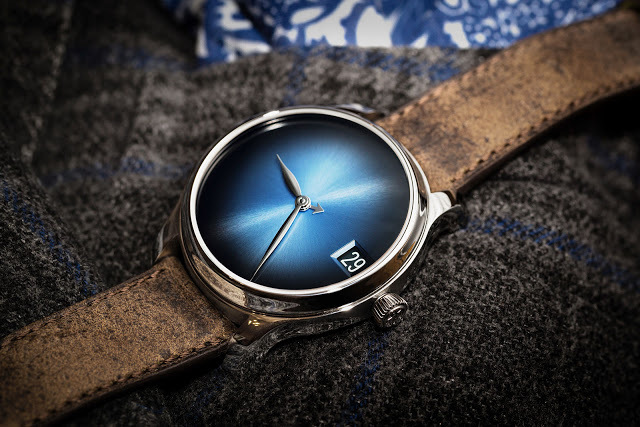 Now it gets even simpler – even simpler than the first Concept Perpetual Calendar unveiled earlier this year – with the Perpetual Calendar Concept Funky Blue that is pared down to almost nothing, and in more affordable stainless steel to boot. H. Moser’s concept watches are characterised by brushed, metallic finish dials with a graduated tone, free of logos or markings. The new perpetual calendar takes that minimalist a step further, doing away with the power reserve indicator and subsidiary seconds. This leaves the dial with only two elements, aside from the time, the date at nine o’clock and the month indicator in the form of a tiny hand at the centre of the dial. The movement is nearly identical to that on the ordinary version of the perpetual calendar, and is visible from the back. It’s hand-wound with a seven day power reserve, as well as an interchangeable escapement. Found in all the top of the line Moser movements, the interchangeable escapement is meant to be swapped out for a new module during servicing, reducing the time needed for the overhaul. A star-shaped wheel on the bridge indicates the leap year. 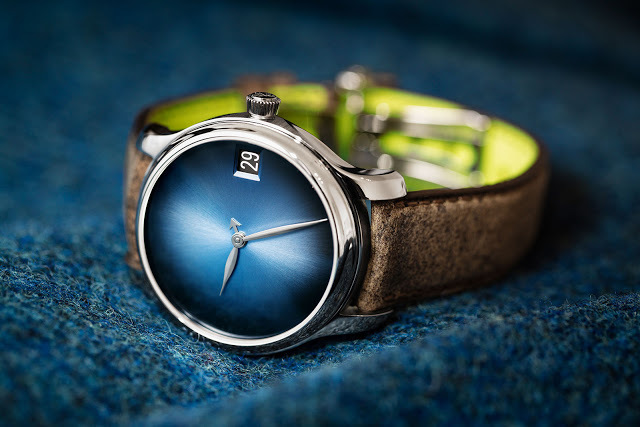 The case is the same as the precious metal versions of this watch, being 40.8 mm in diameter. 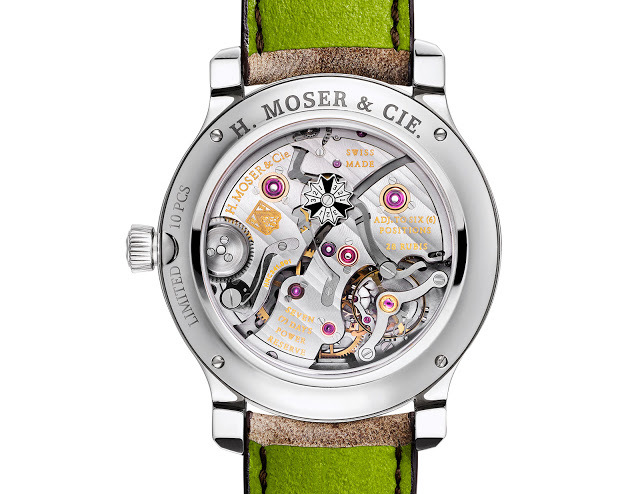 But it’s in stainless steel, the first time this alloy is being used for any H. Moser timepiece. This is a limited edition of 10 pieces with a retail price of US$66,000 before taxes.